Pádraig Harrington likes to repeat a well-worn phrase used by his coach Bob Torrance to explain the difference between good players and great players. Time will tell if Ballymena’s Dermot McElroy goes on to become a great player. But with the Walker Cup selectors eagerly watching his progress this year, the 17-year old produced some great golf on demand to clinch his place in the last 16 of the West of Ireland Championship. One down to his close friend and fellow Boys international Gavin Moynihan of The Island with three holes to play, McElroy showed his class when he hit a five-iron to five feet at the 16th and calmly rolled home the birdie putt to level the match before holing a 20 footer for birdie from the back of the 17th to go one up. It was a good day all round for the Ulster contingent with leading qualifier Paul Cutler from Portstewart cruising into the third round following 3 and 2 wins over former North of Ireland champion Wayne Telford and Headford’s Rory McNamara. Irish Amateur champion Alan Dunbar also progressed with ease with respective two hole wins over Lurgan’s David Sutton and Galgorm Castle’s Benjamin Churchill. But perhaps the happiest Ulsterman remaining in the premises was Belvoir Park’s Harry Diamond, who’s three week trip to the United States with best friend Rory McIlroy worked wonders for his game. The 26-year old confessed that he lost hundreds of dollars testing his game against McIlroy and world stars such as Luke Donald, Dustin Johnson and Camilo Villegas as they practiced at West Palm Beach in Florida in the run up to the Masters. As a result his game was razor sharp yesterday as he defeated multiple championship winner Darren Crowe from Dunmurry by 4 and 3 and then came back from three down with eight to play to beat Lee Valley’s Sean Barry by one hole, setting up a last-16 meeting with Limerick’s Pat Murray. “Playing with players of that calibre in Florida was a real eye-opener,” Diamond said. “It made me see how good you need to be. I had a brilliant time with Rory at Old Palm and the Bears Club before the Masters and I certainly lost a few bucks. Diamond share a house with McIlroy two other friends at Augusta and while he confessed that he was bitterly disappointed that his friend failed to win the green jacket when he collapsed to a closing 80 after leading by four strokes with a round to play, he’s tipping his pal to go on and win a major before long. Three members of the host club made it into the last 16 with 29-year old bank official Gary McDermott coming back from two down with five to play beat Ballyclare’s Simon McConnell by one hole. International Barry Anderson crushed Edenderry’s Daniel Coyle 8 and 7 to set up a clash with Muskerry’s David O’Donovan with the victor set to face the winner of the eagerly anticipated match between Rosses Point’s Steffan O’Hara and leading qualifier Cutler. S Walsh (Baltinglass/UCD) bt W Hanna (Kilkeel) 1 hole. (9.10) C Fairweather (Knock) v S Walsh (Baltinglass/UCD). Paul Cutler hits his fairway bunker shot to the 19th at Rosses Point. It finished just six feet away, setting up a quarter-final victory over Co Sligo’s Barry Anderson.There is a shrine to Cecil Ewing in the foyer of County Sligo Golf Club but if 29-year old bank official Gary McDermott makes a silver deposit in the club’s trophy cabinet today, he will achieve the golfing equivalent of canonisation. 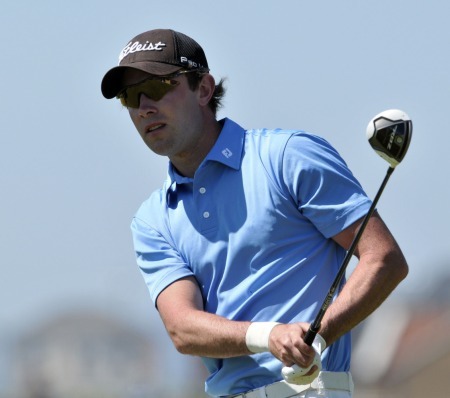 Dermot McElroy was off in the first group in the Irish Open last month. He missed the cut by one but got his revenge by blitzing the Dunluce links with a brilliant, nine under par 63 to top the qualifiers for the North of Ireland Championship. Photo Jenny Matthews/www.golffile.ie It wasn’t quite the course record 61 that a 16-year old Rory McIlroy shot in Portrush seven years ago but Ballymena’s Dermot McElroy showed he’s a seriously gifted talent when he fired a stunning, nine under par 63 on the Dunluce links to top the qualifiers for the North of Ireland Amateur Open at Royal Portrush.